To discover more about the curriculum, what’s included in your cost (and what’s not included), travel information, etc. – please click here. We offer payment in full or payment plan with $195 registration deposit (deposit applies to balance paid). Subsequent payments made via online invoices. 50% balance due on or before September 17, 2018. Payment in full by October 16, 2018. Online payments processed through PayPal – a secure payment gateway. You do not need to join PayPal to make payments through PayPal. Payment in full required 46 days in advance of the session start date. No refunds or transfers to a later session within 45 days of the session start date. Payments are refundable with written notice up to 46 days prior to session start date, minus your $195 non-refundable registration deposit. Transfer of attendance to a later session within 12 months allowed with written notice at least 46 days in advance of session start date. Travel to San Jose no later than Friday November 30th, spend the night, and be present for group bus travel to Cahuita early morning Saturday December 1st. Group bus transportation from San Jose to resort and back is included for those arriving/departing with our group early Saturday December 1st and 15th. 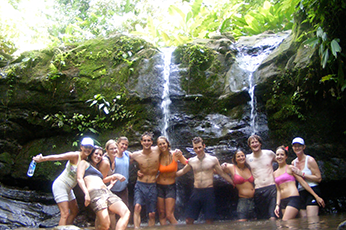 Training is held at beautiful The Goddess Garden – located in Cahuita, Limon Province, Costa Rica on the Caribbean coast. All lodging with en suite bathrooms, daily housekeeping, fresh linens. Departure day is Saturday December 15th, 2018. Schedule departure flight from SJO airport at 1pm the earliest to allow for transit time and early check-in requirements. The airport you will fly into is San Jose Airport- Juan Santamaria Airport – airport code SJO, in Costa Rica. Alternatively you can fly from SJO airport to Limon airport which is only 45 minutes from The Goddess Garden via Sansa Air. The Goddess Garden will be happy to arrange your taxi from the airport for an additional fee.